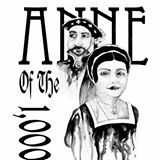 Tonight Anne of the Thousand Days opens at Pontiac Theatre IV -- my "Foolishness" I mentioned last week, but loaded with reasons for the Research part of this blog's title. While my historical storytelling is about "History as seen by the average person", none of the Tudors and the Boleyns or others in their circle were "the average person." At the same time I'm enjoying working with a group dedicated to researching these historical people and their time. It was a time continuing to influence the world even today. Added to that it's loaded with many turning points when things could have changed history. Maybe our own times will be viewed similarly sometime in the future. One error in my previous article needs to be corrected. I misspoke about Thomas Cromwell, who brought the temptation to Henry VIII that permitted not only marrying Anne, but seizing church property to enrich his royal treasury when he formed the Church of England. He was indeed an ancestor of later ruler, Oliver Cromwell, but he was Oliver's great uncle not his uncle. Thomas died in 1540, while Oliver was born in 1599 and was relatively obscure for the first 40 years of his life. Still this American found her ears perk up at the mention of the name Cromwell in the play. With all the historical figures in Anne of the Thousand Days, each of us has had someone as our focus. Mine is Anne's mother (and grandmother of Queen Elizabeth I), Elizabeth Boleyn with much of that Wikipedia article written by William Bjornstad on the Find a Grave website. Elizabeth was raised to see how political fortunes can change and how to survive. Her own time as lady-in-waiting to Henry VIII's mother and then his wife, Catherine of Aragon, brought her into early contact with him. In the play her daughter, Mary, (the title character in the movie, The Other Boleyn Girl, because Henry first took her as his mistress) says, "This family seems to have a strange fascination for the King. There was more than a little talk about you and him -- when you were young." It's true. Possibly this fascination with the Boleyn girls is due to Elizabeth being the first teacher for her daughters before sending each, like herself, for a time to the French court. Elizabeth was well-suited to manage the household of the ambitious courtier, Thomas Boleyn, who rose to become Viscount Rochford and Earl of Wiltshire and Ormond, and ultimately Lord Privy Seal until the execution of his daughter, Anne, along with his son, George. This end of two of her children devastated Elizabeth and she died two years later, followed by Thomas a year later. Only Mary seemed to finish the rest of her life happily. After her first husband died, she secretly remarried a second husband with little money and below her station leading all her family to disown her, although Anne relented slightly with some financial support. It's a pity Henry couldn't look into the future and see the final Tudor monarch, Elizabeth I, would be far better than all the others following Henry. First came his son, Edward, who "reigned" as a sickly boy, dying at age 15, followed by the nine day reign of Jane Grey, and then the five years of Mary, the daughter of Catherine (Katherine of Aragon has various spellings), until half sister, Elizabeth, took the throne at a time when it was bankrupt, in the grip of religious turmoil begun by Henry, and weaker than France or Spain. There are two places I'd recommend as starting points to know more about this pivotal time in British history. Wikipedia can be dry, but it's a thorough launching point giving many options to search. Another source, a British source, English History, is sometimes worth considering because it also mentions the viewpoint of the Tudor times themselves. It's definitely worth prowling the many options there under "Tudor." In the meantime, I hope any local readers catch this history in action in the classic drama about King Henry VIII and Anne Boleyn, Anne of the Thousand Days, by Maxwell Anderson. The production will be held on March 11, 12, 18, 19, 2016 at the Michigan School for the Arts at 819 Golf in Pontiac. All performances begin at 8:00 pm. Ticket prices are $10.00 for adults and $8.00 for seniors and students. Next week, before leaving this "foolishness", I'll give a look at Anne Boleyn's reputation as Britain's most frequently seen ghost. Nothing like a good ghost story for a storyteller!